The detection range is aligned horizontally and when used outdoors may fail to identify a boundary. 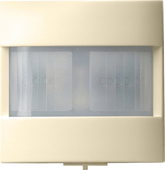 When installing outdoors, find an appropriate location or use the 2.20 m motion detector top unit. Clip-on screen to limit the detection range is included in the scope of delivery.